Speed, Technology and Price Built Around Service, the first customer service book of it’s kind published on e-service. Available in hardcover and for downloading via the Internet. e-Service will explore speed, technology, and price built around service. Geographic boundaries are eliminated and business transactions are faster and more efficient then ever. It’s eat or be eaten. The number of Internet users surpassed 1.4 billion as of March 2008- up from 45 million in 1995. If you receive an e-mail, how long does it take for your organization to respond? 5 minutes, 5 days, or never? If you live in a developing country, are you responding to e-mails 24 hours a day, 7 days a week? While you are asleep your competition is raiding your best customers. Customers love speed. That means they want you to be like Amazon. Net sales for the first quarter 2008 were $4.1 billion up 37 percent. Everything is handled in seconds or minutes. Technology means a customer can place orders 24 hours a day, online, anywhere in the world. GE and Costco do this for billions of dollars in sales. Think globally; make it easy and enjoyable for anyone to do business with you. Price is critical in a globally competitive market. How lean are you? How aggressive are you at eliminating waste? Do you have high performing employees or just untrained bodies? Everything must be built around service. Never forget that you are just one click away from being eliminated. It is eat or be eaten. John Tschohl, the world’s best know customer service author will show you why speed is critical to your survival and how to change your organization into an e-Service driven firm. 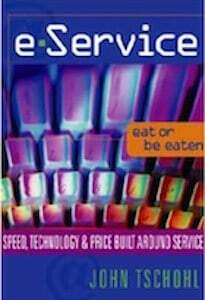 Speed, Technology and Price Built Around Service, the first customer service book of it’s kind published on e-service.